Nutritious – Not surprisingly, consuming raw foods have many health benefits – like contributing to low cholesterol and triglycerides. 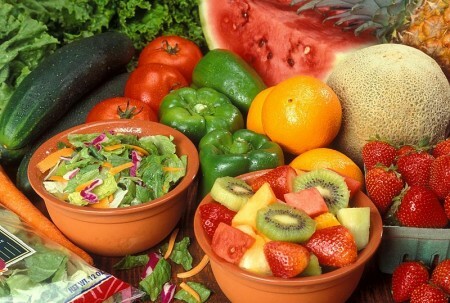 Many foods are most nutritious in their raw form, for example, cooking can reduce the amount of Vitamin C in foods. Maintaining a healthy weight – Raw fruits and veggies are low in calories and their high fiber content can help you feel full. Naturally delicious – Another great advantage is that numerous fruits and vegetables are tasty with no preparation at all. Less packaging waste – I love that eating lots of raw fruits and vegetables means that you are not generating as much waste from packaging. Less dishes and kitchen mess – This one may seem like less of a big deal but it is a big win if I haven’t destroyed the kitchen making my family a snack or meal. Raw foods are a great step toward good health but I’m not suggesting that you go all raw – my research tells me that some nutrients are heightened by cooking, others are reduced, some aren’t changed and there are still a lot of grey areas. Also, there are a lot of really terrific foods that aren’t edible when not cooked – and cooking is fun! So keep in mind that a well-rounded, healthy diet is the best way to ensure that you are nourishing your body with all of the vitamins and minerals that you need. Thanks for sharing, great article very informative. I totally agree with this post. There are really lots of benefits one can get from consuming raw food. I read some of these advantages at http://www.yurielkaim.com. Thanks for this practical advice on raw foods, Jessica…as you say, raw is good but not everything…I love the photo at the top of your post, too! I’m confuse. How do I sign up to get a basket? I love this program, however it’s never offered in Oklahoma City, Oklahoma. Why??? Our oranges are great this week! I thought I’d mention what you can do with the peels since they are often just thrown away. You can wash and dehydrate them and then turn them into an organic vitamin c powder in a blender. Take 1 tablespoon a day for all the vitamin c you need. You can also fill a mason jar with the peels and cover with vinegar and let sit for 2 weeks. Makes a great smelling cleaner. Re cover the same peels to make more. 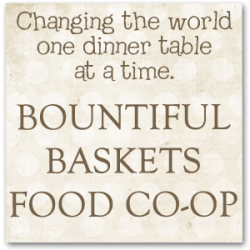 I would like to start a Bountiful Baskets in Citrus Heights, CA but I can’t find a way to have anyone contact me from this company. If anyone knows how to get a hold of the founders please let me know.